I had big plans to make the decorations for Em's Easter birthday party. They were all crafts that came from toilet paper or paper towel rolls, and I thought they would be an easy touch to her party, something homemade by her brother and me. But as the date approached and I had more and more things on my plate, the crafts were pushed to the wayside. It was all well and good because her party was beautiful just the way it was, with nothing lacking in the decoration department. 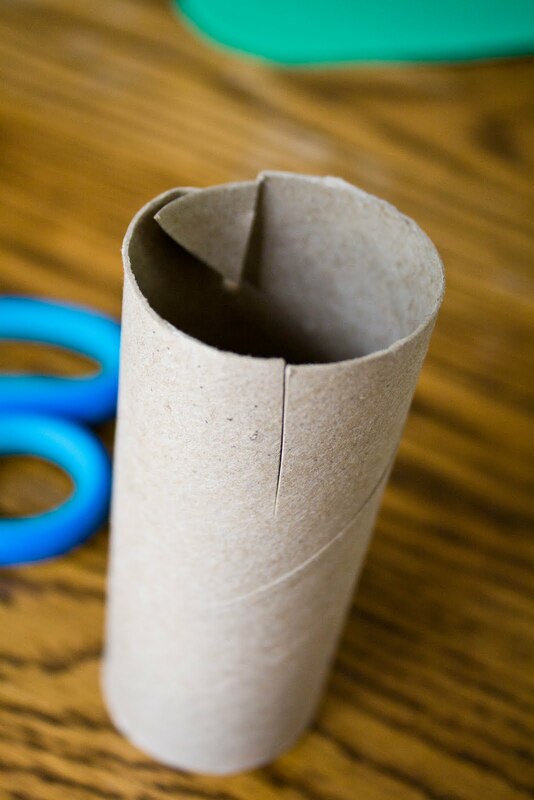 However, now I am left with dozens of empty toilet paper and paper towel rolls that I and many family members saved for me for the crafts that never happened. 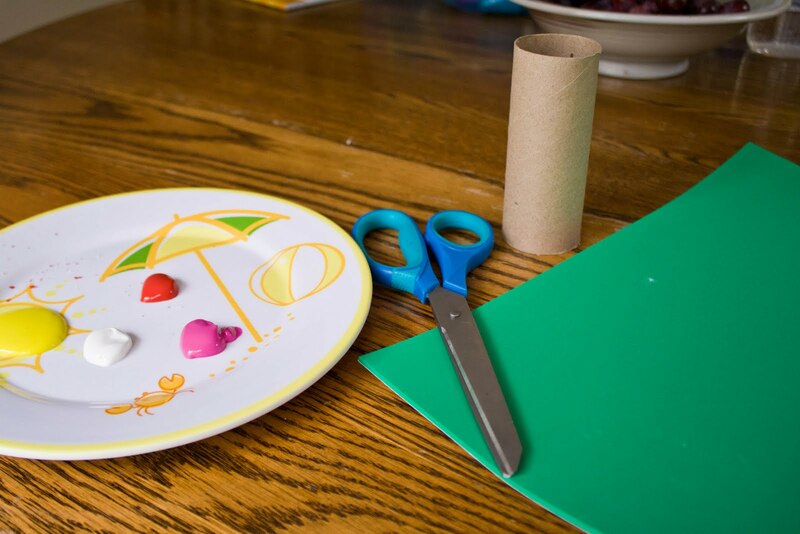 Thus, when you see me doing crafts for the next few months, don't be surprised if most of them feature these recycled items in some fashion or another. Like today! 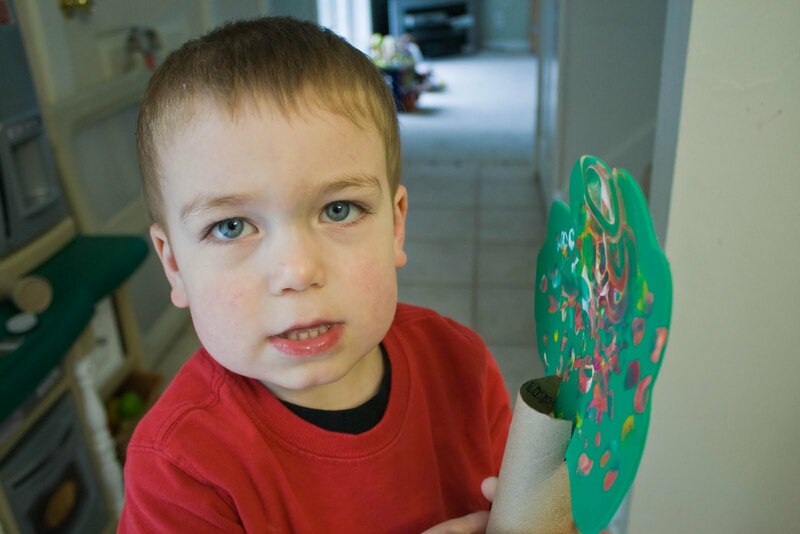 Today is a tutorial for a very neat and simple spring craft. 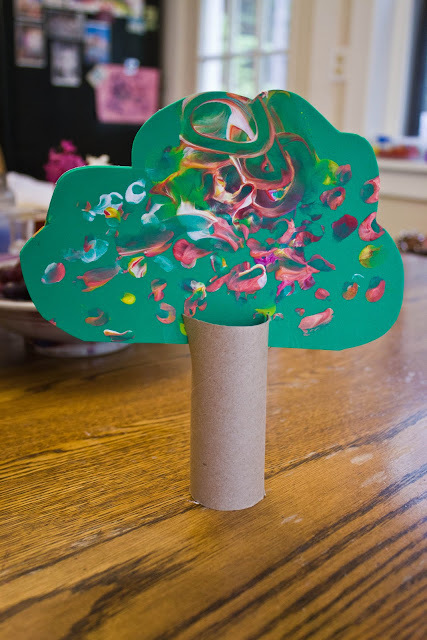 Making a flowering tree out of a tp roll, some foam, and paint. Now, you may not want to use green foam for your tree branches. You could use carboard or cardstock; you just want something stiff that won't flop over once it is perched atop your tp roll. It is the centerpiece of your beautiful creation; you're going to want people to be able to see it! 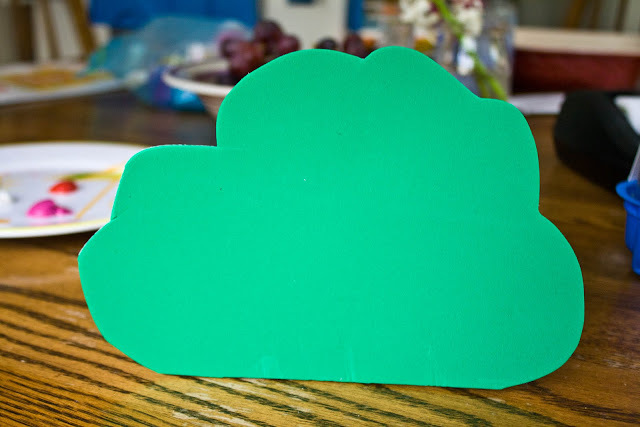 Since I try to make these crafts as absolutely simple as possible, so my two-and-a-half year old can help as much as he can, I used green foam so that it would stand straight and there would be no step involving painting the piece of cardboard green or something. It's already green, it's stiff, and won't flop over. Works for me! Cut your foam into a treetop shape. I could have been more symmetrical but you know I like to be a little crazy with my crafts. Outlining your tree with a pencil would ensure a beautiful, natural-looking, symmetrical tree. I don't roll that way. Just give me a pair of scissors and away we go. Then you cut two slits in your tp roll, across from each other, about a half inch deep. You will be sliding the treetop into these slits, so make sure they are directly across from each other and deep enough to hold it up. 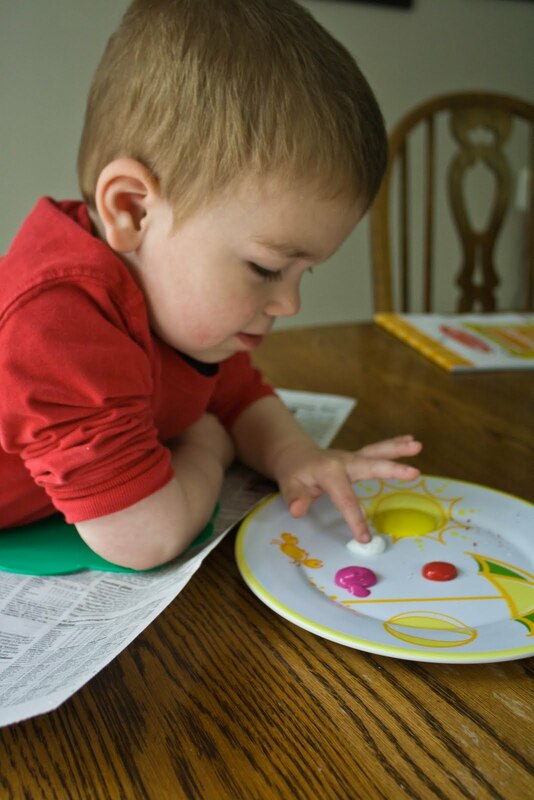 Then, let your child fingerpaint, trying to use mostly just fingerTIPS rather than whole fingers or palm. The dots are supposed to look like spring flowers. This would definitely work in the fall with autumn leaves as well. I used pink, red, white, and yellow paint, because if they ran together, as they inevitably would and did, they would just become a pretty peachy color that still goes with the spring flower theme. I didn't want colors that, once combined together, would turn brown or muddy. And three or four colors are plenty for your tree! 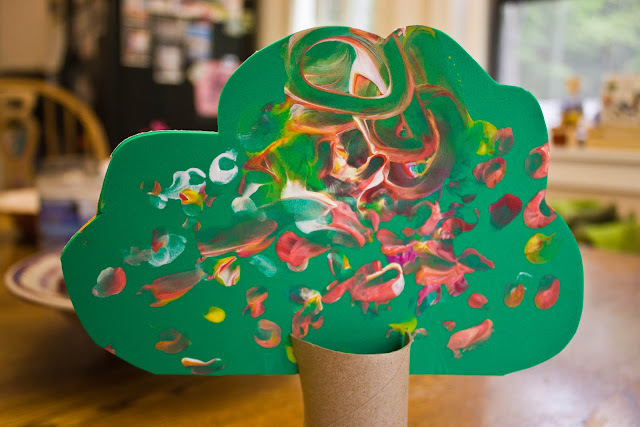 Once the treetop is dry, just slide it into your tp roll tree trunk, and there is your fingerpainted spring tree! 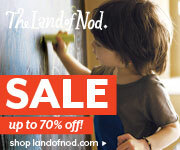 It stands up really nicely on a mantle or on your kitchen table. I love pairing it with other springtime books or actitivies, to help Jax understand the changing seasons. Two books I would recommend in this vein would be Fletcher and the Springtime Blossoms and Snow Rabbit, Spring Rabbit: two books with beautiful illustrations that help kids understand the changing seasons. Don't be surprised if you see these in a Sandbox Book Club recommendation soon! So go make some fingerprint trees and if you do, please link back here and let me know how it goes! And if you want to know where my crafts are linked up every week, please click the Links & Things tab above! What a great idea! Good job, Mom! Those are awesome! 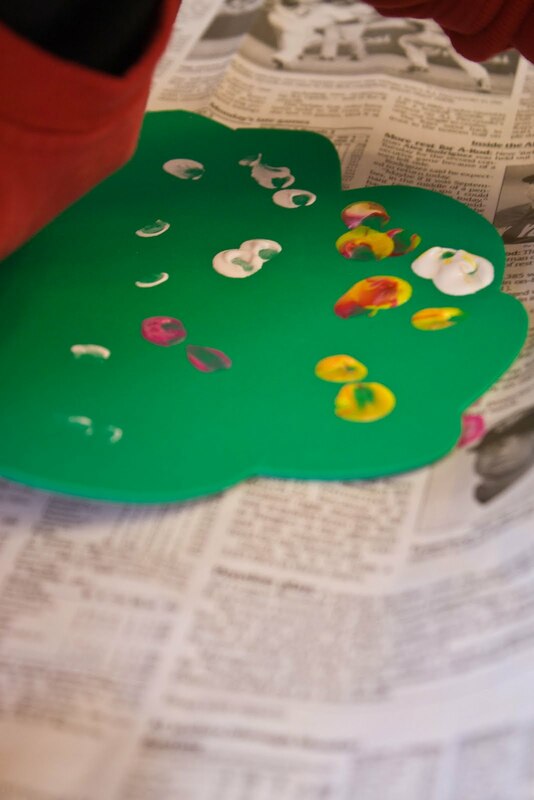 I did that same activity only used white paper for the leaves part (I had the kids dab cotton balls in paint and then decorate the leaves). I like yours way better. I better try this activity again. Great project! Love the fingerprint work on the tree! Great idea and so cute. I love the look of concentration on his face! What a cute idea! I am sure my kiddos would love this! This is such a great idea. I am going to send this link to my cousin. She runs a preschool. This would be great for her students! Thanks for sharing! Great idea..my son already wants to try this! I bet this one was a big hit! 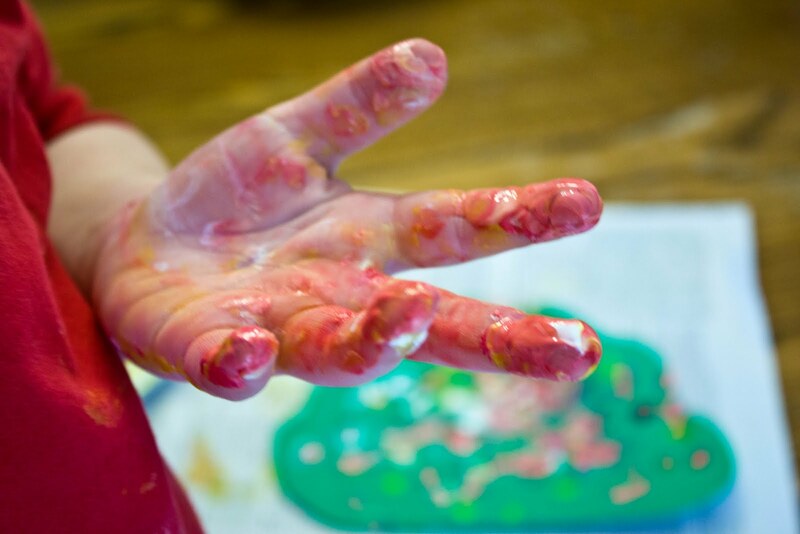 I would LOVE to have you share this at my For the Kids Link Party! Stop on by and join the fun! Oh my Gosh! This is such an adorable project! Love the use of the tp roll to make the base! 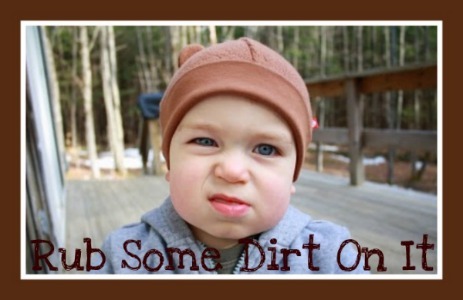 You are one clever mama.. and I just love your header pic.. makes me laugh every time! Thanks for sharing with the Pink Hippo Party! 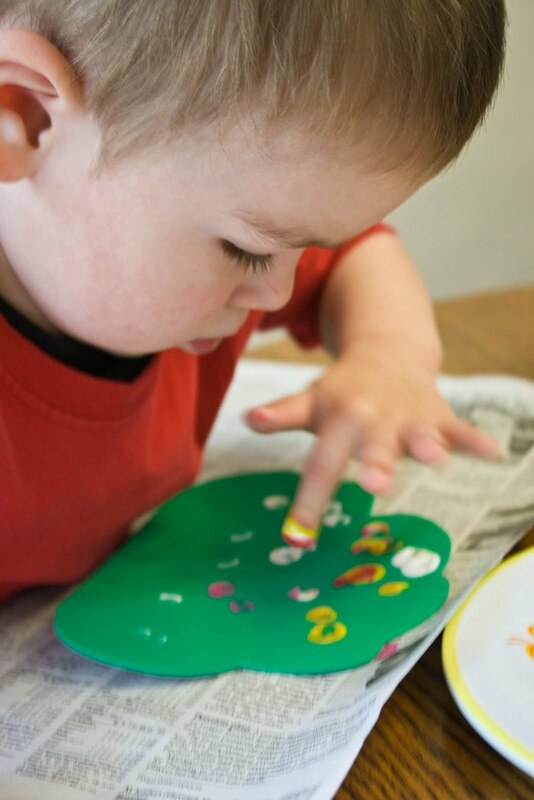 The fingerpaint embellishment is my favorite part! I can imagine a whole village or whimsical forest made with those upcycled tp tubes! Thank you for sharing your creative ideas on "A Little Birdie Told Me..." Tuesday at Rook No. 17! I would love if you would add this to our Playdate Party! What a cute, easy & fun craft! This is definitely something to revisit in different seasons too! I have a TP craft this week too - we have a few saved & I need to use them - they are piling up! 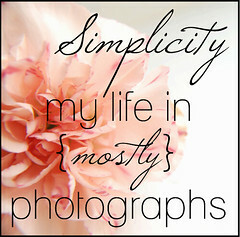 Thank you for linking up to the Sunday Showcase - hope to see more at tomorrow night's linky party!